A game of Dice 10,000 in progress. A player has set the three "3" dice aside and has three left to reroll. Dice 10,000 (or Dix Mille, 6-Dice, 10,000 Dice, Ten Grand) is the name of a family dice game, very similar to Farkle. It also goes by other names, including Zilch, Zilchers, Foo, Boxcar, Bogus and Crap Out. The game requires six standard dice and a pencil and paper for scoring. Each player starts out "off the table" with a score of zero. Players collect points during their turn, and either add those points to their cumulative score, or continue rolling with the risk of losing all points accumulated that turn if a scoring combination is not rolled. To begin a turn, if the player is "off the table," he rolls all six dice. If the roll scores any points, he may set aside each scoring die or group of dice he wants to claim points from, and either roll all remaining dice, hoping to score additional points, or take the points already accumulated this turn and pass play to the next player. Most versions of the game require a minimum score of 300 points in each turn to bank the score and pass, otherwise the player must continue rolling. If the player rolls multiple scoring combinations, only one is required to be taken with each roll, all other dice may be rerolled if desired. If all six dice score points in one or more rolls of a single turn, the player rolls all six dice again and continues to score additional combinations, known as a sweep. If at any time a roll scores no points, the player forfeits all points scored that turn (commonly called "zilch" or "crapping out"), and play is passed to the next player. If a player gets zilch three turns in a row he may suffer a 500-point penalty or lose all his points previously accumulated, depending on the several rules used. In order to get "on the table," a player must score at least 1000 points in a single turn (but not necessarily in one roll). Once a player is "on the table," he is on for the duration of the game. For a player who is "on the table," he may start a turn by either rolling all six dice as described above, or picking up the unused dice from the last player's turn. In this case, instead of starting this turn's scoring from zero, scoring starts from the score taken by the last player. Example: Player 1 stops her turn with 700 points, and opts to not roll her remaining two dice. She adds 700 to her score, and it is now Player 2's turn. Player 2 may pick up those two dice, and if he scores anything with them, he adds those points to 700, as his score, and may bank or continue rolling as normal. Player 2 may instead opt to start over with all six dice, and start his own scoring from zero. This makes the highest possible score in a single roll 8000 for six ones (1000 for three ones, doubled 3 times. (the fourth one doubles the 1000 to 2000, the fifth one doubles the 2000 to 4000, and the sixth one doubles the 4000 to 8000). A straight from 1 to 6 is worth 1500 points. If a player fails to roll a straight they may make one attempt to complete the straight. If the desired number(s) does not turn up on the next roll that round is a "crap out" even if there are scoring dice on the table ie 1's or 5's. Three pairs is worth 1000 points. For instance 2+2, 4+4, 5+5. This rule does not count if you roll a quadruple and a pair4x2 + 6+6. If a player fails to roll a three of a kind they may make one attempt to complete the three of a kind. If the desired number(s) does not turn up on the next roll that round is a "crap out" even if there are scoring dice on the table ie 1's or 5's. 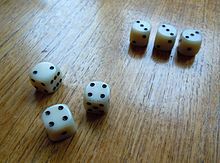 Dice are scored at the time they are rolled, so three or more of a kind must be rolled simultaneously, and dice from later rolls do not "stack" for the higher score. Players have the options to call what they roll or call chance. if a player calls a roll and is successful that player will receive an addition 50 points to add to that score. If the player "craps-out" that he loses the 50 points. Example: Player 1 rolls all six dice, and chooses to score three fours for 400 points. She rolls the remaining three dice for a 2, 4, 5; the additional 4 does not multiply the previous three of a kind, and she can only score 50 points for the lone 5. If she rolls two more 5's with the remaining dice, they will only score 50 points each, and do not form a three of a kind with the other 5. The first player to score over 10,000 points temporarily becomes the winner, and each other player gets one more turn to top that player's score. Whoever ends with the highest score over 10,000 wins the game. In one variation, players must score exactly 10,000 without going over. In the event that a player goes over, the score for that turn is lost. In this variation, if the 10,000 is hit, that player wins immediately without giving the other players a chance to roll. However, if the winner leaves at least one die then the next player may 'roll off the score'.